Two pages. Fine condition. Half morocco case. Eisenhower saw the survival of the Jewish people and Israel in very personal terms. He had personally visited Buchenwald soon after its liberation, declaring, “I made the visit deliberately, in order to be in a position to give first-hand evidence of these things if ever, in the future, there develops a tendency to charge these allegations merely to ‘propaganda.’” He recalled that his sympathy for the Jewish people “was deeply affected by traditional Christian beliefs … [seeing] history as a battle between good and evil … [in which] everyone must choose sides” (Chernus, Eisenhower’s Atoms for Peace). Eisenhower declared, “The Jewish people couldn’t have a better friend than me,” and he acted on that friendship by giving Israel access to the most valuable technology in the world. The new state of Israel would become America’s strategic partner in an increasingly threatening world, and Israel would soon have the wherewithal to protect itself. This document represents a defining moment in modern history and in the history of the Jewish people. 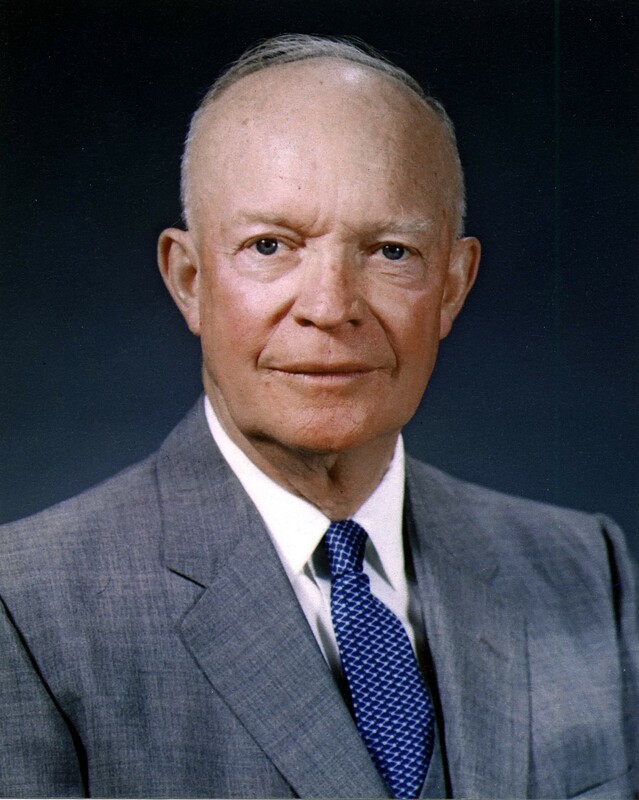 After Stalin’s death in 1953, President Eisenhower proposed to the United Nations that the United States and the Soviet Union share their monopoly of information on atomic power with the rest of the world – but for purely peaceful purposes, and with safeguards against military use of such information. 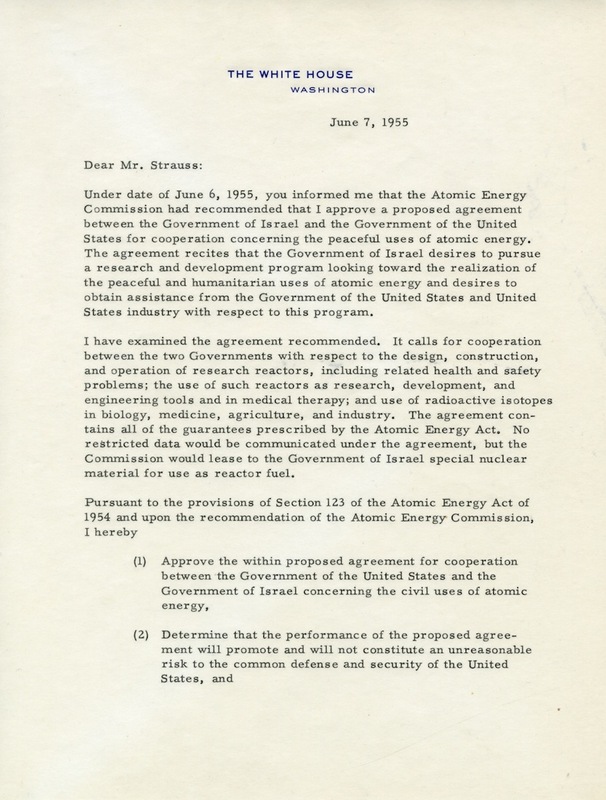 His Atoms for Peace proposal was embodied in the Atomic Energy Act of 1954, which authorized the President to transfer unclassified atomic information and nuclear material to foreign governments, and to assist such governments in establishing atomic research and energy reactors – Israel among them. The United States turned over to Israel a treasure trove of atomic information. A research reactor was soon constructed, and within a year, the American and Israeli Governments staged a joint exhibit in Tel Aviv on the peaceful uses of atomic energy. By mid-1959, Israel’s first energy reactor was under construction, and Prime Minister David Ben-Gurion predicted that soon nuclear reactors would generate all of Israel’s electrical power. At this time, Israel was secretly building a plutonium-producing nuclear reactor at Dimona in the Negev Desert including the capability of reprocessing nuclear material for atomic weapons. By the time of the 1967 Six-Day War, Israel was able to produce at least one nuclear warhead. Eisenhower recognized that America had a special obligation to the Jewish people and to the Jewish state that soon came into being. For Eisenhower, Atoms for Peace clearly meant more than power plants and medical research when it came to Israel. When President Eisenhower’s cabinet would gather to discuss their concerns about whether Israel was building the bomb, the President was not interested in having the matter fully explored. Dino Brugioni of the CIA Photographic Intelligence Center stated, “I never did figure out whether the White House wanted Israel to have the bomb or not” (Hersh, The Samson Option: Israel’s Nuclear Arsenal and American Foreign Policy). In a 1958 briefing, two CIA aerial photography experts showed President Eisenhower and AEC Chairman Lewis Strauss the first spy-plane photographs of the Dimona site in the Negev Desert. The CIA authorities were left feeling “that Eisenhower wanted Israel to acquire nuclear weapons” (Cohen, Israel and the Bomb). 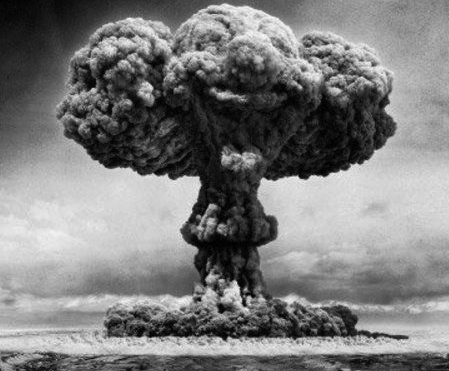 Decades later, while the world had accepted the fact that Israel possessed the bomb (though Israel continued to deny it), “unlike Pakistan and India, North Korea and Iran, Libya and Iraq, Israel has not been asked to give up its nuclear capability or to bare it to the world’s scrutiny; it has not been censured for producing the ultimate weapon, nor has it been threatened with sanctions … the United States has not hesitated openly to express its understanding of Israel’s status” (Karpin, The Bomb in the Basement). 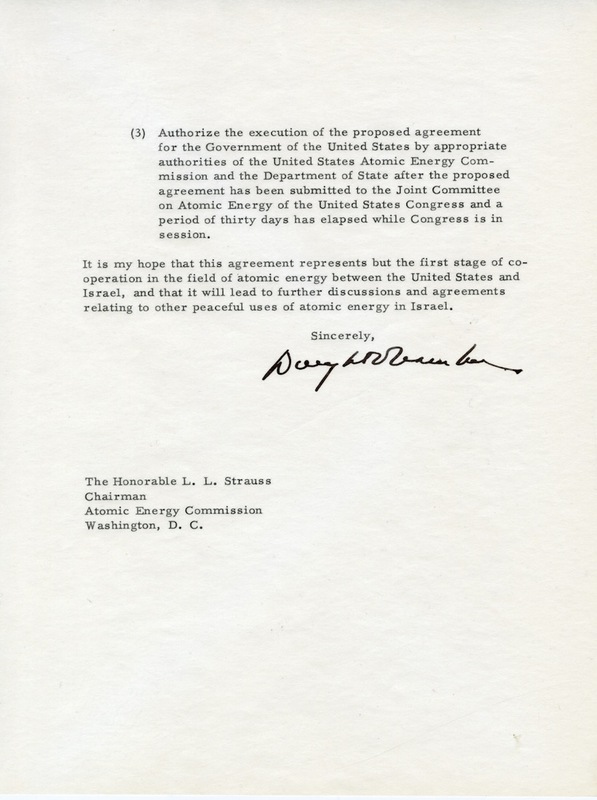 It is this letter signed by President Dwight Eisenhower that ushered in the Atomic Age for Israel and gave it the wherewithal to provide for its own ultimate security. This document represents a defining moment in modern history and in the history of the Jewish people.